If you don’t hear from me for awhile, it will mean that I am without Internet access. I leave in the morning for St. Louis to participate in the Taste of St. Louis art festival. Two weeks ago, at Grapefest, I was unable to get adequate Internet access to blog from my booth (I always like to blog onsite at festivals). So, if the blog goes silent, please understand that I am unplugged. I am posting a reproduction of a large watercolor I completed last year, that is now at the Weiler House Fine Art Gallery (www.weilerhousefineart.com). This print is 8 x 10″ and I have put it in an 11 x 14″ matte with plastic sleeve. The setting is Winfield, Missouri, a sleepy Mississippi River town sprawled along Highway 79 north of St. Louis. I captured this image on camera just as the sun was rising, back in the summer of 2009. I was saddened to see the store out of business, as it featured all the advertising and signage I had loved seeing as a child. Well, I must get some rest for tomorrow’s road odyssey. Thanks for reading. Today has demanded a different kind of “energy” from me. 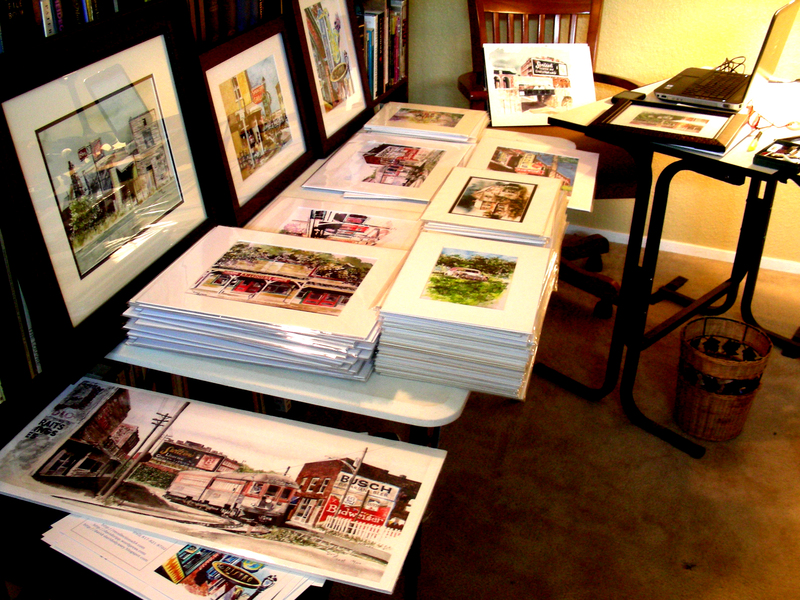 Whereas I have spent several days in retreat in my studio, finishing some original watercolors, today I have worked in a different room on a different task–framing, printing, matting, sleeving, signing and packing inventory for my upcoming festival in St. Louis (Taste of St. Louis). The tasks haven’t kept me from planning my next series of paintings (“My Town 63050”) or reading Thornton Wilder’s “Our Town,” Sherwood Anderson’s Winesburg, Ohio, or even Steven Watson’s Factory Made: Warhol and the Sixties. I have enjoyed some quiet reading, writing, planning and reflection. But today was spent, for the most part, bent over tables and workbenches doing the busy tasks demanded from mass production. Even though Andy Warhol is usually my muse during such endeavors where I often listen to DVD documentaries covering his “Factory” production lifestyle, today I have enjoyed art films such as the motion picture Pollock, along with DVD documentaries featuring Willem de Kooning and Robert Motherwell. Though alone, I have felt the companionship of great solitary artists from the past, creative heroes who still inspire me to push on and find new paths. Pictured here is a stack of prints ready for packing, along with a few originals. The festival is only a few days away, and over 600 miles. I’m starting to feel the excitement of this new adventure. I finally finished this small 8 x 10″ watercolor sketch and am ready to put it in a matte and plastic sleeve. I’ll bring it out at the Taste of St. Louis art festival next weekend. Now it is time to get in the Andy Warhol “Factory” mode, as I have plenty of greeting cards and prints to process, gear to pack and a Jeep to load for next week’s sojourn. Friday night has finally arrived. 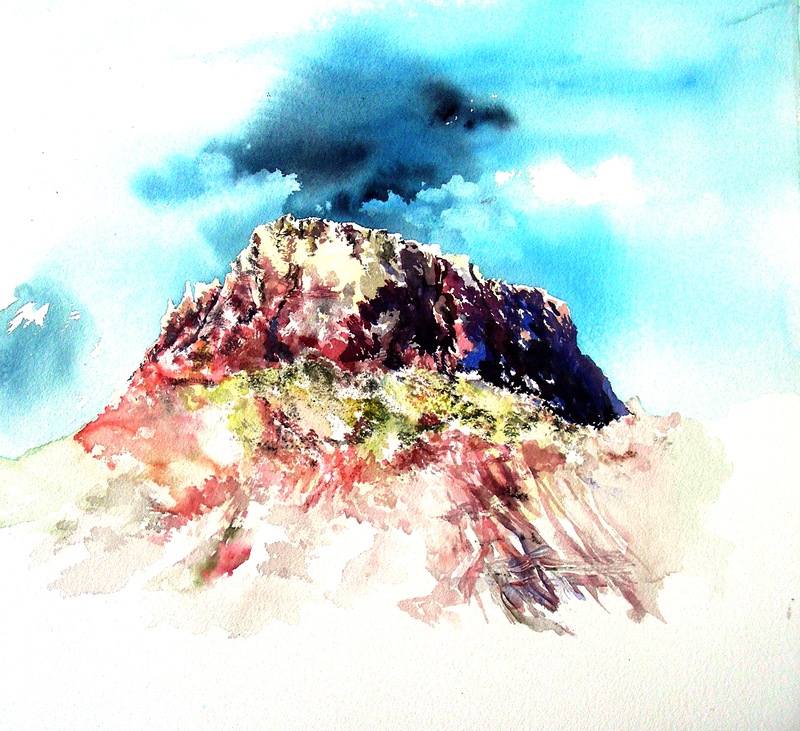 I’ve been able to give plenty of attention to the watercolor I began last evening. I hope to finish this tomorrow. 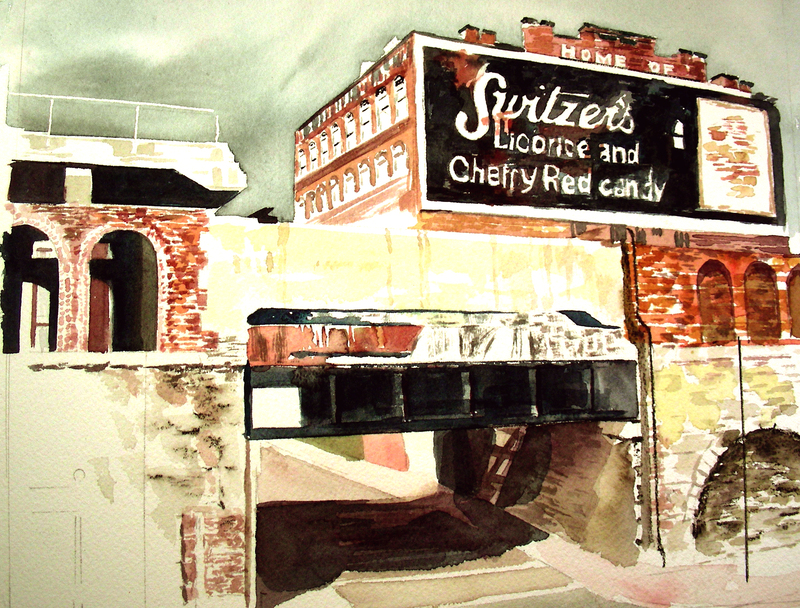 This is an 8 x 10″ watercolor sketch of the Switzer Licorice building that stood in downtown St. Louis during my youth. Unfortunately it was demolished a number of years ago. It has been my attention for several years to do a few studies of the building and see if I can execute a full-scale watercolor of it on a large sheet of paper. If you read yesterday’s blog, you’ll know that I have toyed with reviving a project I abandoned about a year ago–a series of watercolors titled “My Town 63050.” My inspiration came from Thornton Wilder, Sherwood Anderson, Garrison Keillor and any other brilliant mind who created their own fictitious town and grew wonderful stories about them. I once thought I would do the same with watercolor. 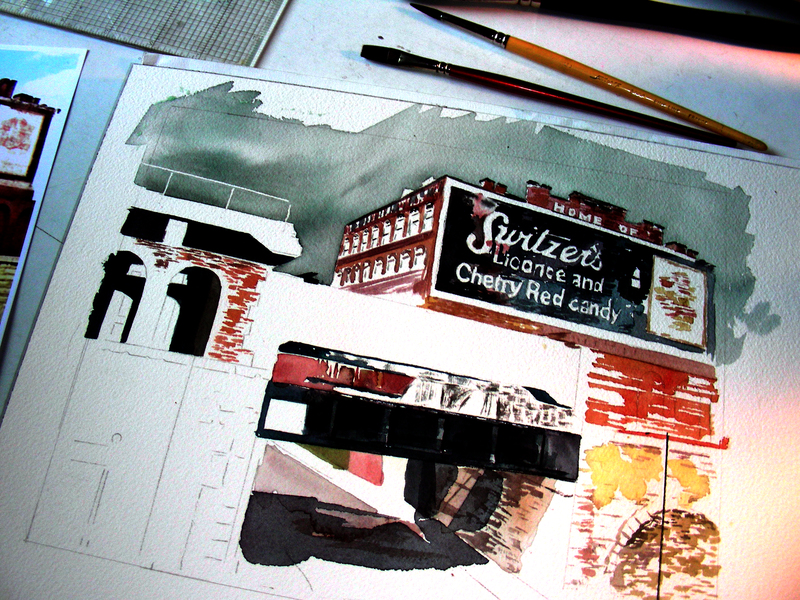 Yesterday evening, I began a small watercolor sketch of the old Switzer’s Licorice building on the St. Louis riverfront that has since been demolished. I grew up looking at that lone sentinel of a building sitting north of the gateway arch, above the Mississippi River. I figured it was time to re-do a painting of it. 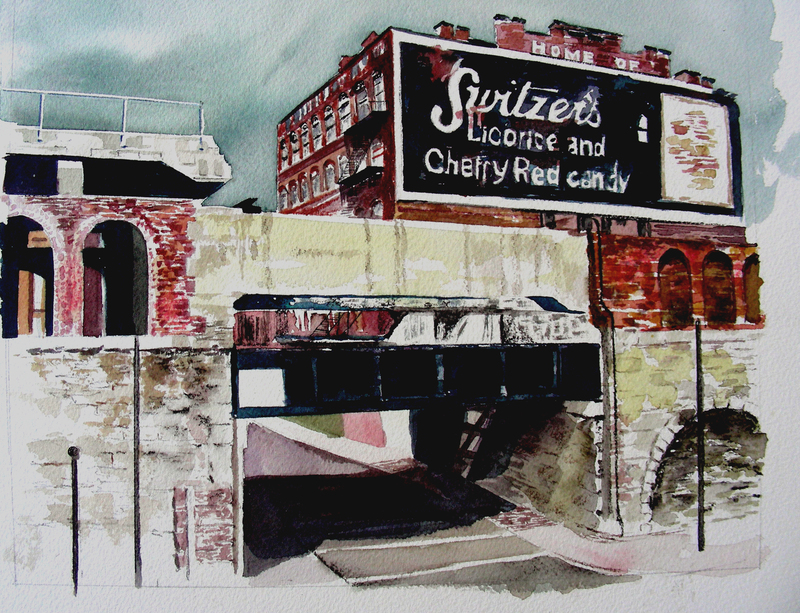 Formerly it had stood in the background of a 1999 watercolor I had titled “Turvey’s Corner.” I look forward to finishing this and matting it to put in my booth next week when I attend Taste of St. Louis art festival. I am having to find another gear as I resume my daily school responsibilities, unpack my gear from Grapefest and replenish my inventory for next week’s Taste of St. Louis. I am posting a watercolor I created in 1999, because I am printing the next series of limited edition giclee prints from it, just in time for the St. Louis show. This marks a turning point in my watercolor odyssey. It is my first successful composite landscape, with the distant building bearing the Switzer’s Licorice ghost sign coming from the St. Louis waterfront (now sadly demolished), the traction train car from a magazine photo, the right building with ghost signage bearing Busch Bavarian and Budweiser logos came from a small town in Illinois (I believe Prairie du Rocher). The buildings on the left (I think) came from New Bern, North Carolina. All of the images came from 35mm slides I took years ago while traveling about the country. I titled this watercolor Turvey’s Corner, because one of my favorite night spots in St. Louis was Turvey’s on the Green on 255 Union Blvd. (now sadly closed) that featured seafood, steak, cigars and St. Louis Blues post-game broadcasts. I would love to go there and hang out and see Blues hockey players relaxing after a game. This painting was to be the first of a series that I would call “My Town 63050”. It was my dream then to create a fictitious town, Anwywhere USA, in the midwest, in the same way that Garrison Keillor created his Lake Wobegon, Sherwood Anderson his Winesburg, Ohio and Thornton Wilder his Grover’s Corners. I did complete four or five paintings of specific buildings and streets, and had planned to design a town map illustrating where these structures were placed, complete with street addresses. At some point, I abandoned the project, and only one of the paintings remains in my possession, all the rest of them sold and none of them were editioned. The zip code is fictitious–I grew up in High Ridge, 63049, and attended high school in the neighboring town House Springs, 63051. I still think of this abandoned project now and then, wondering if I might take it up again. I did enjoy the creative juices and imagination I experienced as I worked out the various compositions. As it turned out, Friday was also a slow day for sales at Grapefest in Grapevine, Texas (thank God for Saturday and Sunday!). So, I found time while sitting in the booth to sketch out a second watercolor. Both paintings were 8 x 10″ works which I inserted in pre-cut mattes and slipped into plastic sleeves. 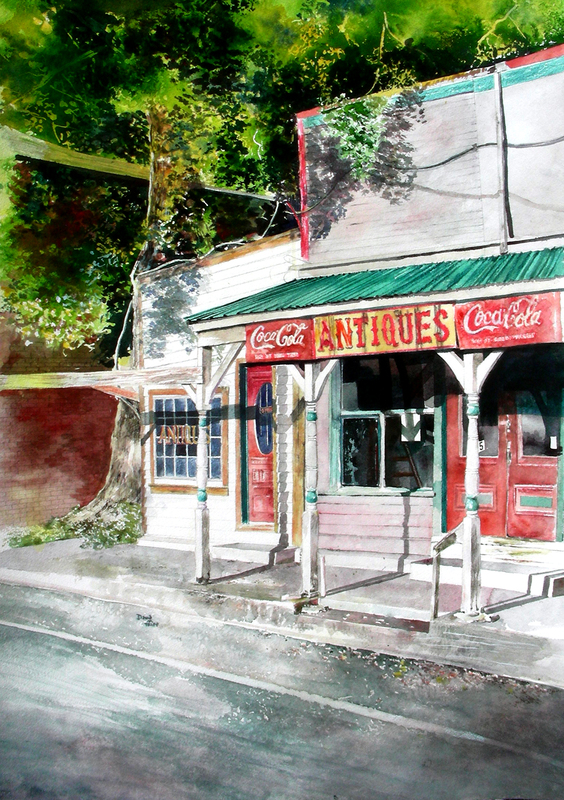 This subject was painted from another 8 x 10″ enlarged photo I took earlier this summer while in Eureka Springs, Arkansas. 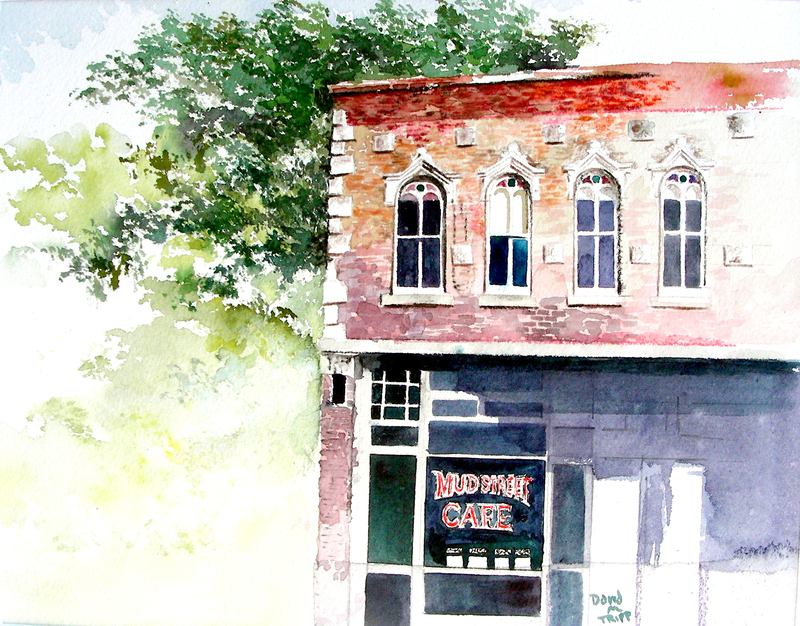 It has been my deep-seated privilege to teach a one-week plein air watercolor class at the Eureka Springs School of the Arts in the middle of June in recent years. I have been asked to return next summer for my fourth consecutive term. The Victorian mountain town is so exquisite for anyone wishing to paint outdoors. This photo is of a rustic facade of businesses in the lower section that I managed to photograph in the waning light of the summer evening. I may be making too much of this, but I am very happy with how the cool lavenders played alongside the warm oranges in this painting. It was an accident, but I’ll take it! I was enchanted with the summer light in Arkansas, always wishing I could capture some of its essence on the paper with watercolor washes, and I believe it happened this time. When I took the photo, I was fascinated with the misty veils that seemed to swirl in the gathering shadows of that warm summer evening. This is something I want to explore further, and hopefully will get an opportunity this weekend, as I am slowly catching up with my school work responsibilities. Some classes I open a book to begin. Today in philosophy I opened a vein. Good afternoon. After days of weariness, I finally feel as though I have re-entered the world. I am coming off a four-day art festival that averaged 13-hour days sitting in a booth, then going home to catch four hours of sleep and return. That, coupled with the strenuous load-in and load-out of my booth, furniture and art work, left me physically devastated. The festival ran Thursday through Sunday night, and I had to rise at 6:00 Monday morning and resume teaching my high school classes. Frankly, I remember only fragments of Monday and Tuesday. But today was a new and splendid day. I began with a Philosophy class at 7:35, where we reviewed our past research and findings in the Presocratic thinkers, then folded their ideas into the legacies of Socrates, Plato and Aristotle. The ninety-minute class (to me) seemed only to last five minutes, and it was over. I was breathless. I went to my journal and penned the couplet that opens this blog (I would be horrified if I were to find out that the words were already used–they felt like my own, and still do). Next, I waited for the back-to-back ninety-minute Art History classes to arrive. The topic was Andy Warhol as the Genius of Pop Art. I had prepared an extensive powerpoint presentation, and used it as a springboard to open an energetic discussion on his “factory” approach to creating and marketing art, his mysterious persona, and the overall fun that springs from the creative process. We enjoyed contrasting the Pop Artists and their bare commercial images with their predecessors–the Abstract Expressionists along with their esoteric, brooding themes and academic theories. Again, the two classes felt as though they ran five minutes each, and then they were over. I was finished teaching. I just collapsed in my chair, thankful for a good day, a sublime day in an educational setting where students seemed genuinely hungry and enthused to learn, to explore new frontiers. O.K., the painting posted above–I sketched out this watercolor on Thursday, the first of the four-day Grapefest held in Grapevine, Texas last week. For some reason, the Wi-Fi access was spotty (unlike last year, when I blogged daily from my booth). I could not get my photos uploaded, and the Internet access was flowing like molasses. So, I gave up, deciding to post the stuff on the following week. At any rate, Thursday was a very slow day for sales, and not very many patrons were flowing through the festival, especially from 10:00-5:00. So, I brought with me my watercolor supplies and an 8 x 10″ enlarged photo of some residences I photographed in Trinidad, Colorado during one of my past vacations in that “colorful” state. As I recall, it was in the morning when I captured this, the mountain atmosphere and golden sun rays were bathing the facades of the neighborhood houses, and I could hear that oft-quoted line of Edward Hopper: “I have been a stranger to humanity. 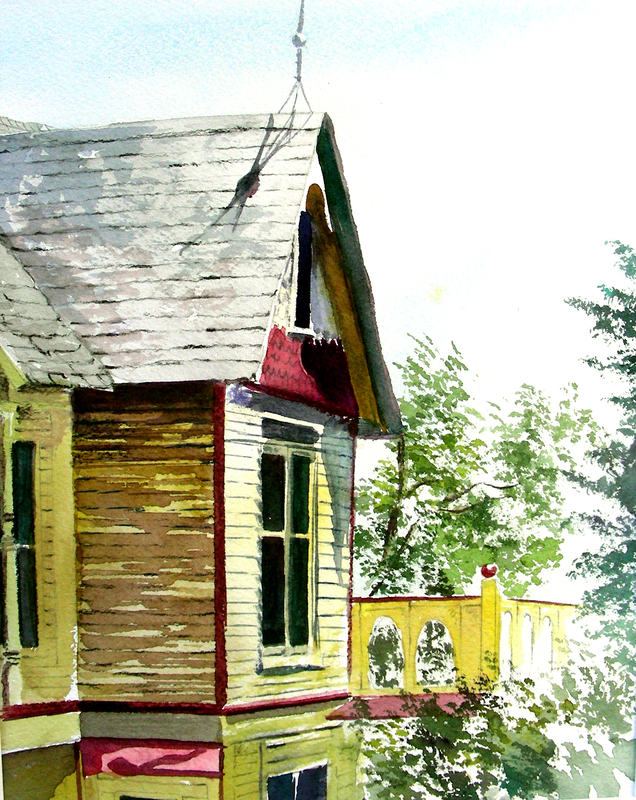 All I wanted to do was paint the sunlight on the side of the wall.” I was always smitten at the sight of his painting Second Story Sunlight, wishing myself to paint one day the steep-pitched roofs and gable ends of frame houses bathed in the morning sun. I found my opportunity at last while sitting in my art booth, looking at a splendid photo composition of a Colorado mountain morning. The same kind of sun that flooded that Colorado morning had a way of flooding my soul during my classes this morning at Martin High School. I’m grateful to look back now on such a day. It is now 5:49 p.m., and I’m feeling a substantial measure of satisfaction. Wednesday night, I will be setting up my booth for the four-day Grapefest art festival at Grapevine, Texas. All the pieces are nearly in place, but it looks like I could still be putting in some late nights today and tomorrow. There is still some matting and shrink-wrapping to complete, and I have two watercolors still to finish (I would like to have them ready by festival time). 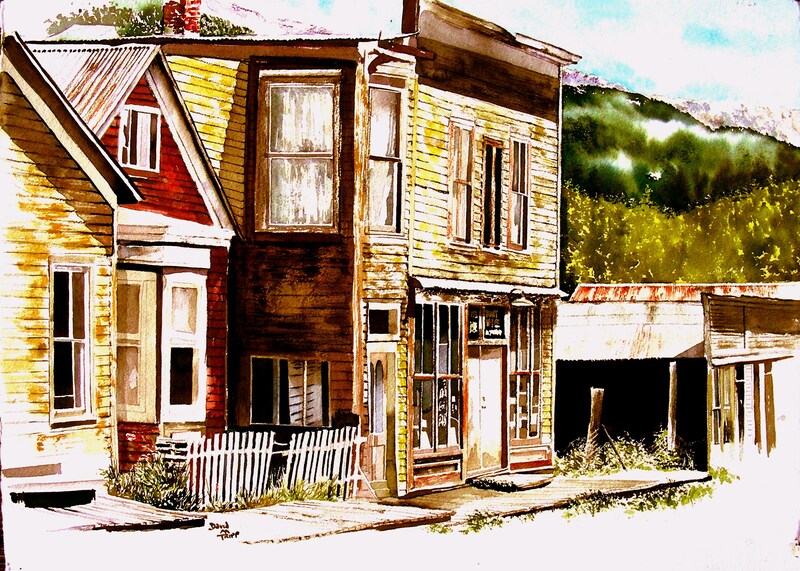 This is a painting of the ghost town of St. Elmo, Colorado, near Tin Cup Pass. I photographed it on 35mm slides about ten years ago, and finally got around to painting it this summer on a full-size sheet of watercolor paper. I’m getting ready to shrink-wrap it and matte it for sale in the booth this weekend. I wish I could write about where this mountain is located. I have photographed dozens of them from Colorado, New Mexico and west Texas, and honestly I have no idea where I found this one. The only reason I painted it (and it is quite large, filling a full sheet of watercolor paper) was to test out a new palette of colors, departing from what I’ve used the past couple of years. I’m preparing a large matte and shinkwrap for this one as well. I guess it doesn’t hurt to have a few large pieces at hand in the art booth next week. Well that’s it for tonight’s blogging. Thanks for your patience. I’ve put up quite a few. Now I’m returning to paint until I get sleepy. Hopefully I’ll return to the blog tomorrow.